This tutorial is all about how to tweet from slack directly without accessing your Twitter account. If you’re looking for a method to directly tweet anything on your Twitter profile from Slack, then you’re in luck as this tutorial explains a simple and effective method to do the same. In this tutorial, I will use a free Slack integration app called “BirdyBot” in order to post tweets from Slack. BirdyBot allows you to post tweets by simply telling the bot to tweet something for you. For this, all you need to do is install BirdyBot and invite it to any of your Slack channels. Apart from letting you tweet, it also allows you to retweet, like, follow & unfollow, and even delete a tweet right from Slack. Let me explain how to use BirdyBot to tweet from Slack. Step 1: Before you can start posting tweets from Slack, you need to install BirdyBot and authorize access to your Slack account. 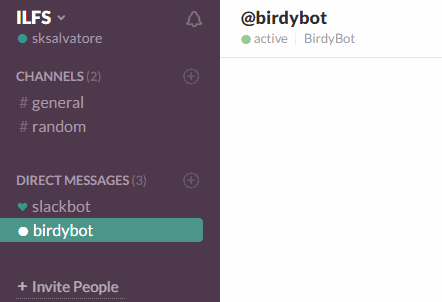 After that, it will integrate with Slack and you’ll be able to see a username in the “Direct Messages” section named as “birdybot”. To tweet from Slack, you’ll need to tell the bot and to tell the bot you’ll need to click “birdybot” in Direct Messages section. 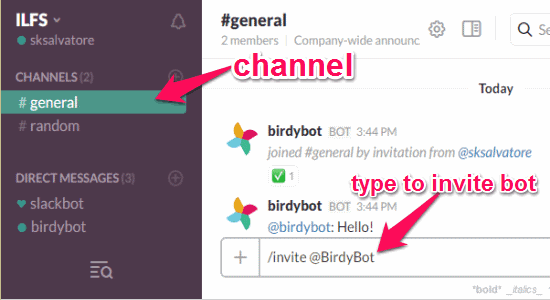 Step 2: Now, you need to invite the bot “BirdyBot” to any of your Slack channels. To do this, click on any channel and then type “/invite @Birdybot” in the input field at the bottom and hit Enter. Then the bot will join the channel and will be ready to accept your commands. Step 3: After inviting Birdybot to a channel, you need to connect your Twitter account with that particular channel. To connect a Twitter account, click “birdybot” in the “Direct Messages” section and then type “setup twitter for #your channel name“. Press the Enter key and it will automatically generate a URL in the conversation which can be used to authorize and connect your Twitter account. 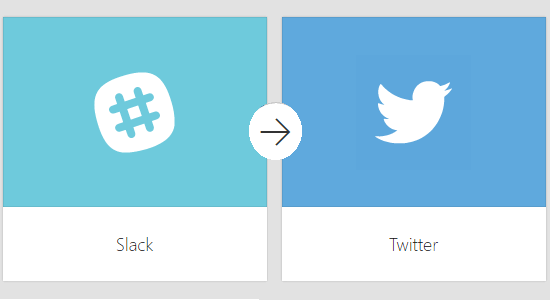 Remember, you can only connect one Twitter account with each Slack channel. 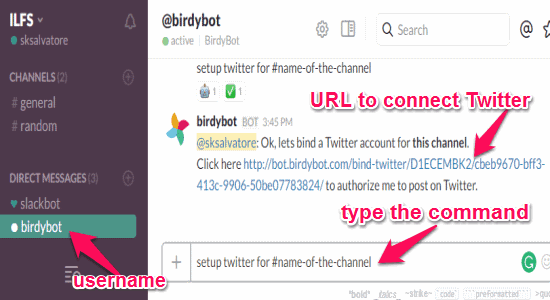 Step 4: That’s all, once you authorize BirdyBot to access your Twitter account, you can start posting tweets by telling the bot on Slack. Let’s get started with posting tweets from Slack. Click the username “birdybot” in the Direct Messages section and then type “@BirdyBot tweet” and then give a space and type anything you want to tweet. When you’re done, simply hit Enter and the tweet will be posted instantly in your Twitter profile. For example, if you type @BirdyBot tweet What a great day it is, then the tweet will be posted as What a great day it is. Step 5: Apart from posting Tweets from Slack, you can also retweet, like, follow, unfollow, and delete tweets using BirdyBot. I am going to simply mention the commands which you need to give the BirdyBot for performing these options. Retweet – Type @BirdyBot rt “the Tweet id or Tweet URL“. Delete a Tweet – @BirdyBot delete “the Tweet id or Tweet URL“. Like a Tweet – @BirdyBot like “the Tweet id or Tweet URL“. Follow a User – @BirdyBot follow “the Twitter username or Profile URL“. Unfollow a User – @BirdyBot unfollow “the Twitter username or Profile URL“. This tutorial includes some simple steps using which you can tweet from Slack without much hassle. All you need is the Slack integration app called “BirdyBot” and you’re all set to go. 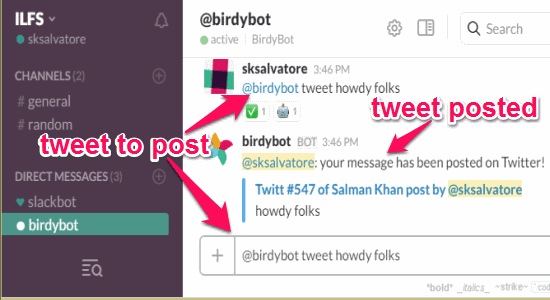 BirdyBot allows you to post tweets, retweet, delete tweets, like, follow and unfollow users directly from Slack.